At the current time around 80% of NHS funding comes from general taxation. General taxation is the most efficient way of raising money, having very low overheads relative to the money raised. Taxation is also the most equitable approach to funding: tax is progressive: companies and individuals with more income and wealth pay more; financial and health risks are pooled, so sick people do not pay more than those who are well. International comparisons  have repeatedly demonstrated that funding through taxation is by far the most efficient mechanism and, indeed, the only successful route for providing comprehensive medical coverage in low and middle income countries . Time and again, surveys have demonstrated that the British public is willing to pay more tax in exchange for well-funded, free and comprehensive healthcare. National Insurance (NI) is used primarily to fund state benefits, including unemployment, maternity allowance, sickness benefits and state pensions. NI is a regressive tax since there is a cap on the top contribution, NI contributions stop when the individual reaches pension age, and contribution levels are not related to ability to pay. The level of benefits paid out is related to the NI contributions an individual has made. Every year or so, there are renewed calls from right wing politicians in all parties to fund the NHS through a hypothecated National Insurance tax. 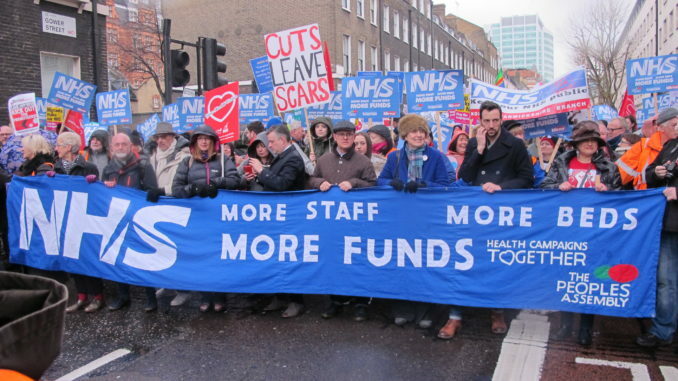 The public rationale for such a tax is that it is a way of safeguarding NHS funding into the future, and protecting the NHS from general austerity measures. This is nonsensical for reasons set out above, and particularly in rejecting the additional income provided by those with more wealth that comes through general taxation. However the public justification also hides some very real dangers of funding through a separate National Insurance payment. Politicians on the right – in all parties – have made no secret of their preference for private-insurance-based healthcare. Separating out healthcare taxation from other taxes would make it much easier for a future government to make access to healthcare dependent on the level of NI payments made, or for instance, to allow exemption from NHS NI contributions if, for instance, individuals opted for private health insurance. KONP calls on politicians from all parties to reject these repeated calls for an hypothecated NI tax for the NHS, and to support full and fair funding for the NHS through general taxation. I fully agree. Funding the NHS from National Insurance, which was supposed to be for social security and sickness benefits but is now simply regarded as part of general taxation, will open the door for more private tenders. We should tell the private tenderers to re-industrialise and export their manufactures to get down our trade deficit of £90bn. Virgin has no business tendering for public services and it just makes an awful mess of everything it touches. Walking away before time because, if it had looked more carefully, it would know that it cannot make enough profit from public sector institutions like the NHS and our Railways. Chuck the private firms out. They just want to milk the taxpayer and we won’t stand for it.